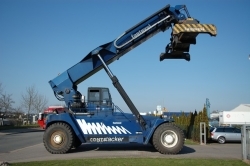 Hinrichs Flurfoerdergeraete GmbH & Co.KG deals in used Container Handling Machines, forklifts of all sizes and makes. We are offering a wide selection of Container Handling Machines and Heavy Duty Forklifts, Warehouse Equipment and Port Equipment. Hinrichs Flurfoerdergeraete GmbH & Co.KG is Germany's leading distributor in the materials handling industry for worldwide delivery. Your enquiry has been sent to Hinrichs Flurfoerdergeraete GmbH & Co.KG.